Ohio Veterans of War Commissioner Clayton Uzell presents the Ohio Law Enforcement Officer of the Year award to Shelby County Sheriff John Lenhart Saturday, Jan. 12, in Columbus. COLUMBUS — The Ohio Veterans of Foreign Wars has honored a Jackson Center resident with one of its highest awards. 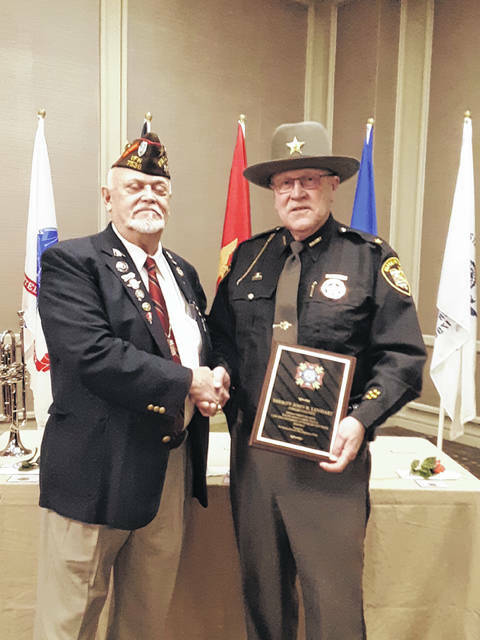 Shelby County Sheriff John Lenhart was named the Ohio VFW Law Enforcement Officer of the Year. He received his plaque, certificate and $300 for a charity of his choice Saturday in Columbus during the VFW’s annual meeting. Lenhart is donating his gift to the Jackson Center Education Foundation. “I was surprised when I got the letter,” said Lenhart. “This award was a little bit different for me. Usually we receive awards from within our own (law enforcement) organizations. This one comes from outside that. Lenhart was nominated for the award by the Alvin Metzger VFW Post 8445, Wapakoneta, and was the District 2’s selection to be entered in the statewide competition. VFW Commissioner Clayton Uzell is in charge of the selection of the Law Enforcement Officer of the Year. A retired police officer, Uzell and three other judges read all the nominations for the award. Each judge awarded points for different categories in the competition. The person who received the most votes was named the winner. Nine out of the 12 districts in Ohio submitted a nominee for the award said Uzell. Uzell cited some of Lenhart’s accomplishment’s: youngest deputy to be elected sheriff in the state of Ohio; worked as a road deputy so he knows what it’s like to walk on the thin blue line; worked for BCI and upgraded their automated fingerprint system and DNA testing; and worked with two presidents — Ronald Reagan and Bill Clinton — on a committee for crimes and the Brady Bill. During the ceremony, said Lenhart, the VFW presented scholarships to 12 students — one from each district in Ohio — for essays they had written. Some of the essays dealt with the Right to Vote and others were about what it’s like to be an American. Uzell said the Voice of Democracy winners were impressed with Lenhart’s award. Many of them talked to the sheriff after he received his award. Lenhart said his two grandsons, who are interested in law enforcement, accompanied him to the event.